Michael Harrison is a professional ventriloquist who has been working cruise ships. You can read about him at his website by clicking here. Michael has been working the Disney Magic for several years. The ship docks every Saturday at Port Canaveral, about 10 miles from where I live. Michael contacted me with an amazing story. Many years ago a Canadian ventriloquist named Frank Merryfield performed under the name The Cornish Wizard. That ventriloquist was Michael Harrison's great-grandfather. Michael never met Merryfield, but he heard stories about him all his life and had pictures such as this one of his great-grandfather performing. A while ago Michael was visiting a magician friend, Don Robinson, who told him he had something that Michael should probably have. 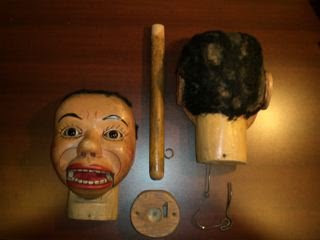 From a trunk in the attic, the uncle pulled out Sonny, the dummy that Merryfield performed with. Michael took Sonny home and thought about how he could use it in his shows. Sonny's story is compelling, and Michael thought he'd like to do a bit where he tells the story and then introduces Sonny to the audience. Except that he did not want to expose this personal treasure to the rigors of performing. He did not want to risk its damage or loss. So he decided to have a copy made. We discussed the various options and agreed that I will build a new body and make a replica of the head. Michael will perform with the replica and the original can stay at home safely in storage. Sonny should look about the way he looks now. 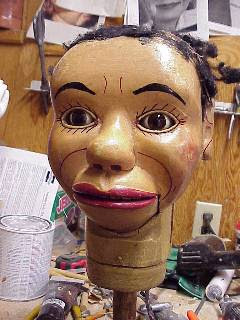 But it's difficult to see what a dummy looks like based on a grainy old snapshot and a pile of parts. So, my first job was to put the parts together and see what we have. Here he is. His jaw mechanics are unlike anything I've seen with a complex linkage made of a stiff spring and two moving lengths of stiff coat hangar wire twisted to form a lever action. It looks like the work of someone who has never seen the insides of professsional ventriloquist dummy. My guess is that Merryfield either made the dummy himself or had it made. Of course, given the times, it could have come from nearly anywhere. He might have found it in a pawn shop. Who knows? 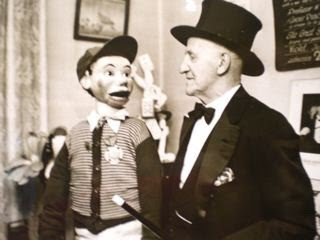 I am not an expert on vintage ventriloquist dummies. Perhaps an expert out there can shed some light on the mystery. In the meantime, this little guy named Sonny is mounted on the workbench and about to get a twin brother.